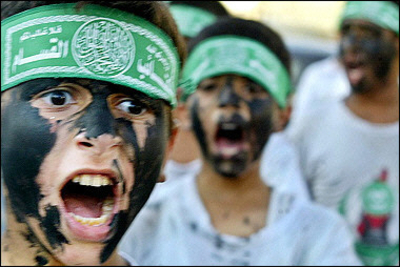 Hamas is reporting record turnouts for its summer camps for children in 2011. The ‘summer camps,’ combining Islamic indoctrination, paramilitary training, and social activities are set to begin again this year as United Nation’s summer camps, considered competition by Hamas, are being openly denigrated by jihadists. Children and adolescents are an important target demographic for Hamas, from which its future army of terrorists will be recruited. Summer camps are an important means for indoctrinating Gaza’s youth with Hamas’ jihadist ideology. In 2010 Hamas ran camps for an estimated 100,000 campers, a number similar to 2009. The Islamic Jihad terror group ran 51 camps with 10,000 participating boys and girls. Some 200 Palestinians armed with bats and iron chains raided the illegal West Bank outpost of Gaon HaYarden Friday and burned Jewish holy books at the site, the settlers said. 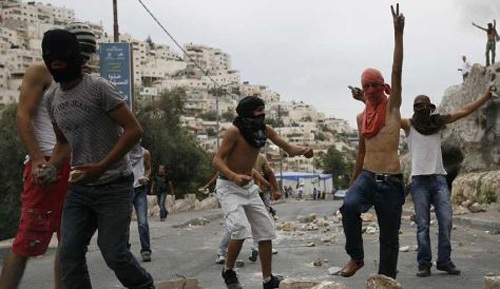 The Arab attackers clashed with Jewish youths at the outposts before torching a hut and a tent that included a prayer corner and holy books. Security forces rushed to the scene and broke up the violence. The Palestinians arrived at the outpost in dozens of vehicles and razed it. A leading member of the Jewish Hilltop Youth movement vowed to rebuild the outpost after the Shabbat. An “image of Jesus” seen in dripped wax by worshippers at a church in Wiltshire has been removed by a cleaner. 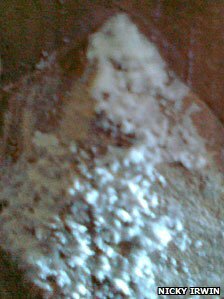 The face was first spotted by a church warden at the parish church of Ogbourne St George at Easter. The image, described as a a man with a long beard, was formed by candle wax dripping from the church’s pulpit. Created over a four-month period, the wax image was apparently removed by a diligent cleaner last week, although nobody has owned up. Nicky Irwin was the church warden who first spotted it. “I was sitting in church just before Easter a little bit bored by a sermon when I saw it,” she said. The image could only be seen from a certain angle. “You had to be in the right seat,” said Mrs Irwin. Although many within the small congregation saw a face some were unwilling to “sign up to more then that”, she said. Despite going through the church’s cleaning rotas, no-one has admitted to scraping away the wax image. “I felt really disappointed actually and I wished I’d done more about preserving it,” admitted Mrs Irwin. Jerusalem – Israeli police say policemen have entered a sensitive Jerusalem holy site to disperse Palestinian protesters who were hurling stones. The scene of Friday’s violence was the Old City compound known to Jews as the Temple Mount and to Muslims as the Noble Sanctuary. Israeli spokesman Micky Rosenfeld says police entered the compound after Palestinians began lobbing stones at security forces stationed outside one of the gates. He says police used stun grenades to disperse the crowd. Rosenfeld says no one was injured and that order was quickly restored. The holy compound is one of the most combustible sites on earth, and clashes there in the past have ignited broader violence. A Muslim clerical body runs the compound under Israel’s overall security control. Israeli police briefly entered the flashpoint Al-Aqsa mosque compound after Friday prayers and fired tear gas towards stone-throwing youths, police and mosque officials said. Police fired tear gas and one person was arrested, she said. A spokesman for the Islamic authorities that run the mosque said one or two youths had been throwing stones, but the incident ended quickly. The sprawling mosque compound contains the Al-Aqsa Mosque and the Dome of the Rock and is the third holiest site in Islam after Mecca and Medina. It is also the holiest site in Judaism because it was the location of the Second Temple, razed by the Romans in 70 AD. This is the hand of a baby aborted at 10 weeks.